The dough for this Hungarian Apple Strudel or Almás Rétes recipe is a little unusual. Most strudel doughs call for either oil or butter in the dough, but not all add eggs, sour cream, and vinegar as this Hungarian recipe does It's delicious! 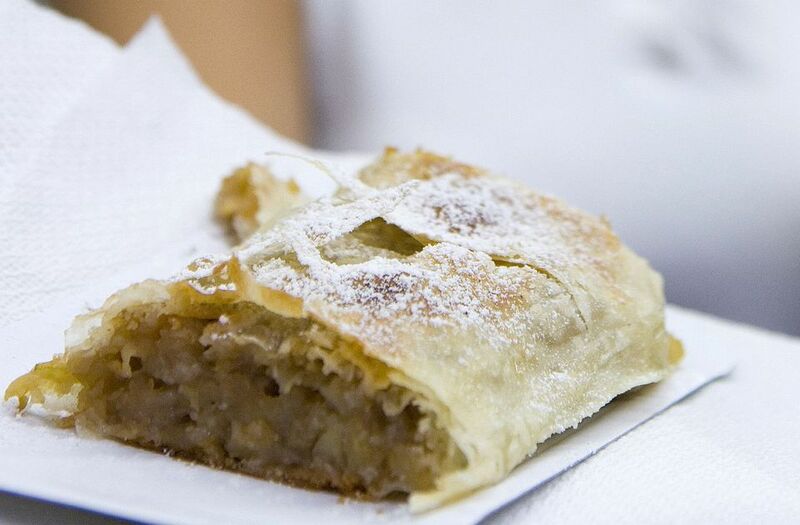 Here are more Eastern European strudel recipes. In a large bowl, blend flour, sour cream, vinegar, salt, egg yolks, baking powder, butter and water. Knead for about 30 minutes. Dough should be light and very smooth. Cover and let rest 1 hour. Mix together thinly sliced apples, 2 cups sugar (or to taste), 1/2 teaspoon salt, 1 tablespoon optional cinnamon, 8 ounces melted room-temperature butter and a splash of lemon juice. Raisins and ground walnuts can be added, if desired. Refrigerate, if not using immediately, but let it come to room temperature before filling the strudel dough. If a lot of juices have accumulated at the bottom, pour them off before placing on the strudel dough. Cover a large table with a cloth and sprinkle it lightly with flour. Place dough in center and roll it to about 1 inch thick. Now flour your hands lightly. Place hands, palms down, under dough and stretch gently in all directions toward the edge of the table. While stretching, ease dough by lifting it gently. Be gentle to prevent tears! When stretched to the thinness of tissue paper, trim off the thick edges (this can be kneaded, rolled and cut into noodles). Spread dough with melted shortening. Let dough rest 10 minutes. Sprinkle entire surface of dough with bread crumbs. Place apple filling all over entire surface of dough. Heat oven to 375 degrees. Use the cloth to roll the strudel away from you. Cut into two strudels. Tuck in the ends. Place on a parchment-lined baking sheet and brush entire surface of strudel with melted butter. Bake 30 minutes or until flakes start to separate and strudel is shiny and golden brown. Transfer to a wire rack to cool slightly. Cut into slices and serve slightly warm with ice cream or whipped cream.